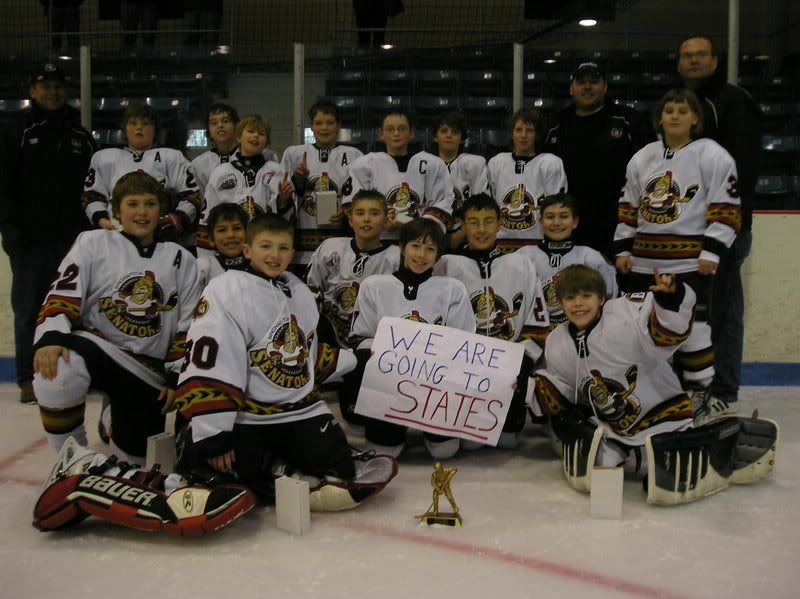 After a successful showing at the pre-sectional tournament in Skaneateles a couple of weeks back, it was now on to the sectional tournament for the Binghamton Junior Senators Squirt A team. 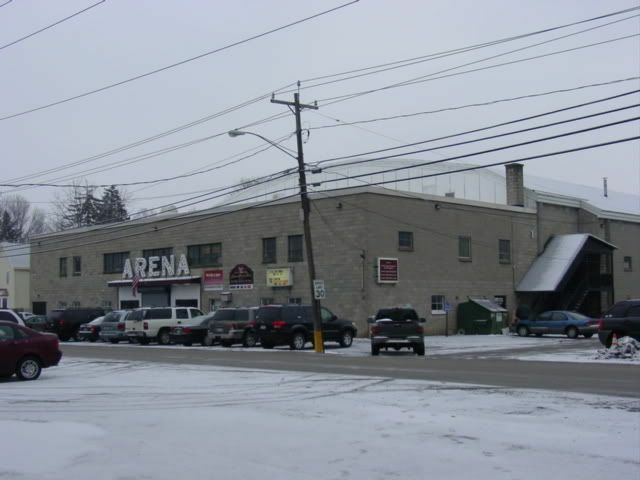 This years tournament was being held in Clinton, New York - just outside of Utica - at the classic Clinton Arena. We started out on a snowy and slushy Friday morning, making the trek up 88 as far as Sydney before picking up Route 8 for almost the remainder of the trip. It was a bit of a tedious drive, with the weather, two lane road, and tanker truck in front of us spraying water and slush on the car for a majority of Route 8. We arrived at the Clinton Arena around 9:25 (after leaving the house at 7:15) for the 10:00 game against the team from New Hartford. I'll use an interesting cliche' at this point, but 'in these parts' the words Clinton Arena evokes visions of a classic old rink. 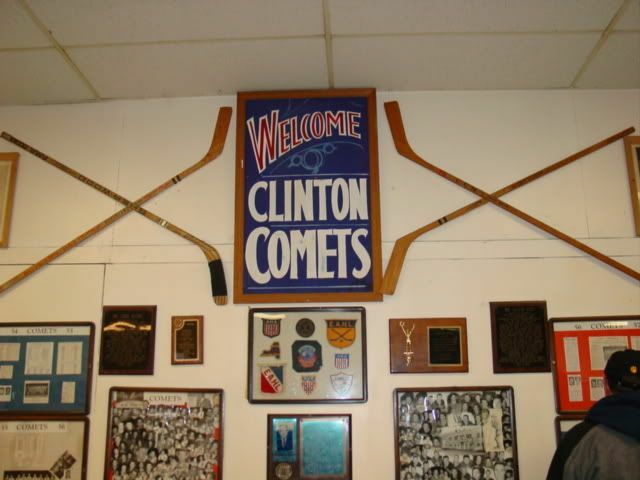 The Clinton Comets played in the old Eastern Hockey League from the late 50's until the very early 70's. 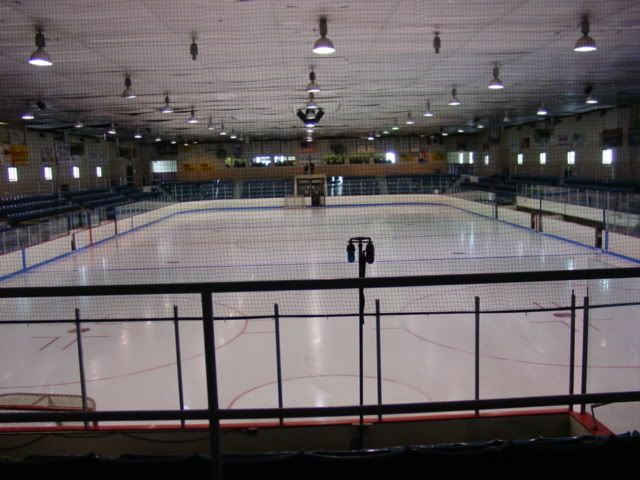 This rink, in layout and design, was much different than many of the other 'youth rinks' that we frequent, and in some ways this place just breathed hockey history like many of the other classic rinks that we've been in. The Sens started out quick in the game, scoring an early goal in the first period. New Hartford then struck back with four unasnwered tallies before the Sens scored two more, making the game interesting at 4-3 in the third period. The Sens tried their best to even the score, but New Hartford scored on a deflection from the point with about 3 minutes to go in the third. Final of this game was 5-3. Michael did not play in the game against New Hartford. After the game, we slipped and slid into Utica, looking for somewhere to eat lunch. We weren't very successful in finding someplace in the City of Utica to eat, so we ended up in New Hartford where we tried to go to a Mexican restaurant, which we found to be closed, then to the Ground Round, which we also found closed, before settling on a Carmella's. Lunch, then a trip to the mall across the street, then we went to the hotel. For this trip to the Utica region, we stayed at an old 'mainstay' for us, the Radisson in Utica. It's pretty well situated in the middle of Utica, and as a usual bonus - there's an indoor pool! Mike went down swimming for a while, and I caught a quick nap (I had worked the night before and was dead tired). In the evening, we found (what else??) a hockey game to go to! 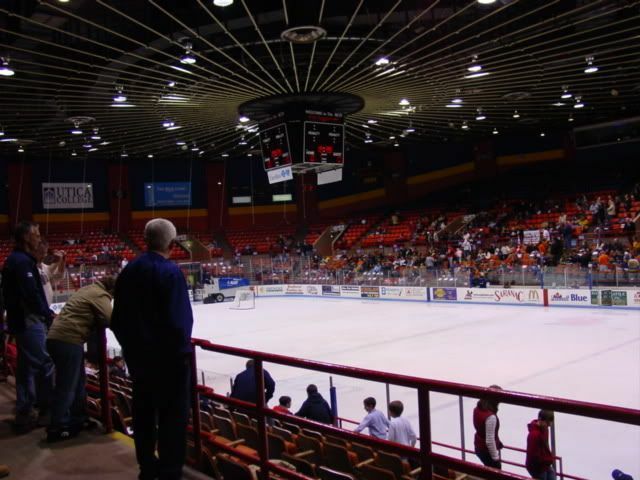 Within two blocks of the Radisson was the Utica Memorial Auditorium, and its current tennant, the Division III Utica College Pioneers were home against Lebanon Valley. 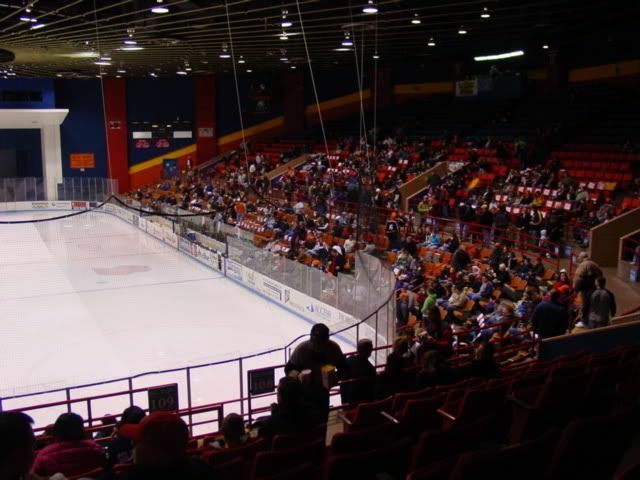 Previous teams in the Aud include the Utica Devils, and Mohawk Valley Prowlers (of the AHL and UHL respectively), but both teams and leagues had left Utica years back, leaving the Pioneers the only game in town. Looking at the attendance stats though, they are a well supported team in this town. The home team didn't disappoint the crowd of over 2400, thrashing the visitors 11-1. Dinner after the game was at Delmonico's, an upstate New York popular mainstay. We all had a good dinner before heading back to the hotel for the night. Saturday morning brought an old foe for the Sens - the Camillus Cougars. In three previous game this season, the best the Sens could do is tie them in one of the games, losing the other two contests. Expectations for a win are always there with these kids, but today's game that expectation was a bit guarded though. The goalie for Camillus was solid in all of the games we played this season, and the offense knew they were going to have to be extra sharp to pull out the win. On the heels of two Nate Walker goals, and a Jeremy Wilbur goal (on a shot from the point), the B-Sens won the game 3-1, setting up a showdown with the home Clinton Comets on Sunday morning - winner of that game is going on to the State Championships. For lunch, we searched out Napolis Italian Bakery and Deli on Culver Ave in Utica, famous for their tomato pie! Very yummy! Back to the hotel to have some lunch and relax for the afternoon. The evening found us back at the Utica Memorial Auditorium for to watch the same two teams we had the night before. Utica handled the Flying Dutchmen as easily as they had on Friday night, and by the time we left halfway through the third period, the Pioneers had an 11-0 lead. Normally, we don't leave games early, but it was obvious that Lebanon Vally just gave up in the second period and the game got pretty boring by the third. We wanted to grab dinner after the game, so we drove to Babe's to grab a bite to eat - big mistake on our part. The waitress was terrible (forgot to bring the sauces that went with our appetizer and Jill's sandwich, and Michael never saw the soup that was suppossed to come with his meal) and the food was so-so. Definately on our list of places not to go back to if we find ourselves in Utica again. Sunday morning was the earliest game we were scheduled for all weekend. An 8:30 start against the home Clinton Comets in a 'winner takes all' affair. All the Sens had to do was win or tie this game, and they would be heading to States. It was a pretty evenly matched game, the score 1-1 after the first 12 minutes of play. The Sens found themselves up 2-1 after two, and then scored an empty netter towards the end of the game for the 3-1 win and a trip to the state championships, to be held in Clifton Park, New York in a couple of weekends. Michael did not play in this game. After the game it was in the car and home for us (for a couple of hours until we were on the road again!). 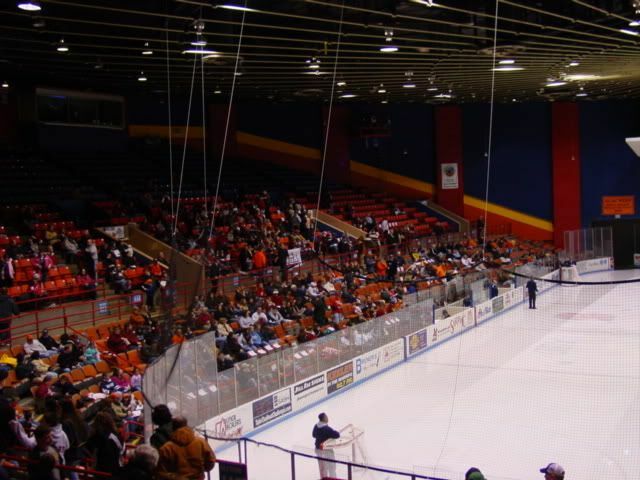 UTICA � Utica College was supposed to win this hockey game. After all, Lebanon Valley had won just one game coming in, and it was apparent early on that the Pioneers had the Dutchmen seriously outgunned. �Supposed to, but we only won 2-1 last time, so you never know going into games,� said UC�s Matt Fitzgibbons. No, you don�t, but Fitzgibbons made sure the Pioneers took care of business, scoring three goals and adding two assists to lead UC to an 11-2 victory in an ECAC West game before 2,852 fans Friday at the Utica Memorial Auditorium. �It was nice to get a hat trick,� said Fitzgibbons, a 6-foot, 194-pound forward from Natick, Mass., who said he probably hadn�t had a five-point game since he was playing Midgets. Fitzgibbons has had a hat trick before at UC, scoring three goals in his very first game, against Hobart last season. Vinny Rinaldo added three goals, Jeff Pap palardi had four assists and Colin Kingston three for UC (7-6-1, 14-9-1), which still has an outside chance of clawing into second position in the conference playoffs but very likely will end up third � if they take care of business again tonight against the Dutchmen on �Go Red for Women Night,� which will benefit America�s Greatest Heart Run and Walk. �We have to come out with the same effort we did in the second and third (Friday), and we�re fine,� Fitzgibbons said. Casey Mignone and Jarred Frey scored third-period goals for Lebanon Valley (0-14, 1-22-1), which was outshot 49-17. The Pioneers got off to a slow start, collecting only a short-handed goal by Fitzgibbons in the first period despite building a 17-5 shot advantage. �We talked about getting that second goal and getting that third goal,� said Heenan, wanting to make sure his team didn�t let the Dutchmen hang in. Nick Kulas and Fitzgibbons took care of that, scoring 35 seconds apart in the opening two minutes of the second period, and the Pioneers were off and flying, adding four more goals in the period and then outscoring the Dutchmen 4-2 in the third. In other league games Friday, Hobart defeated Elmira and Neumann downed Manhattanville. UC is left in a fourth-place tie with Hobart, but owns the tiebreaker with the Statesmen. Utica, NY- The Utica College men�s ice hockey team defeated visiting Lebanon Valley College 12-0 Saturday night in ECAC Men�s West Conference action in front of 3,334 fans at the Utica Memorial Auditorium. The Pioneers have earned the No. 3 seed in the ECAC Men�s West Conference Tournament and will travel to No. 2 Manhattanville College on Saturday, Mar. 1 for the semi-final match against the Valiants. The last time the Pioneers traveled to Manhattanville for a conference tournament semi-final match-up on Mar. 3, 2006, the Pioneers won 5-3. With the win, the Pioneers close out the regular season with a 15-9-1 overall record and they are now 8-6-1 in the ECAC Men�s West Conference. UC, which is currently ranked No. 14 in the latest NCAA east region rankings, now owns a 14-1 all-time series advantage over the Dutchmen. Following the loss, Lebanon Valley is 1-23-1 overall and to 0-15 in conference play. UC went 2-of-4 on power-play opportunities on the evening and earned a 47-11 shot advantage over the Dutchmen. The Pioneers were issued just two penalties the entire night. UC came out firing within the first minute of the contest as junior Colin Kingston sent a pass to the stick tape of sophomore Aaron Jeffery, who took the lead and beat Lebanon Valley freshman goalie Rich Drazin to give UC an early 1-0 lead at the 1:05 mark. Also credited with an assist on the goal was senior assistant captain Joe Watson. Minute�s later sophomore Matt Fitzgibbons scored his fourth goal of the weekend, beating Drazin top shelf to give the Pioneers the 2-0 advantage. Senior defender Tony Wiseman, playing in the final regular season home game of his career, assisted on the Fitzgibbons goal along with sophomore forward Jeff Pappalardi. Pappalardi got in on the action and gave UC a 3-0 lead at the 15:49 mark of the first, when he beat Drazin on an assist from Joe Watson and Vinny Rinaldi. Watson�s 65 career points is good for fourth all-time, right in front of junior forward Colin Kingston, who has tallied 64 career points and is now fifth on the college�s all-time scoring list. The Pioneers scored six second period goals and took a commanding 9-0 lead over the Dutchmen. Sophomore forward Vincent Nucci opened the second period scoring 5:06 into the period on an assist from Rinaldi and Watson. Fitzgibbons netted two more goals in the second period and eventually his fourth of the night to open the third period, which gave him seven total goals in the two game set against the Dutchmen. His first goal of the second period came at the 6:04 mark and was assisted by freshman forward Sean Farley. Fitzgibbons now has a team-high 12 goals on the season. Just 44 seconds later the Pioneers took a 6-0 lead when senior forward Vinny Rinaldi scored his eighth goal of the season on an assist from Pappalardi. Fitzgibbons, Nucci and freshman Nathan Brummit netted the stanza�s final three goals. The Pioneers netted three insurance goals in the third period to earn the 12-0 victory headed into the ECAC Men�s West Conference Tournament Saturday. Senior goalie Adam Dekker stopped all 11 shots and earned his second shut out of the year, while improving his record to 9-5-1. Lebanon Valley goalies Rich Drazin and sophomore Aaron Miller combined for 35 saves on the evening. 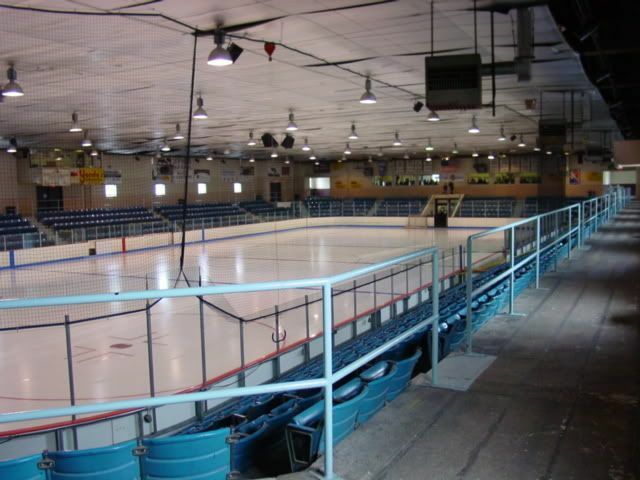 I had a friend ask for some pics of the classic old barn in Clinton, so here ya go Lance!